The fire in Exeter’s Cathedral Yard on 28 October 2016 has had an unexpected legacy: the revival of public interest in the city’s historic built environment and the reawakening of popular interest in the city’s remaining historic buildings, aspects captured in new Historic England research, perhaps offering a perspective delegates can take to the 2019 Nottingham School! 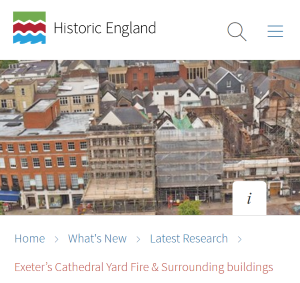 Historic England has published research on buildings in Exeter’s cathedral close that were damaged by fire. Two buildings were destroyed and many more had severe or incidental damage. The fire developed into an international news story because it concerned ‘England’s oldest hotel’, the famous Royal Clarence Hotel. The St Martin’s Island Project supported by Historic England culminated with the publication of a lengthy book in November 2018. The research focused on the five structures which were mainly affected along with another thirty-seven nearby in the St Martin’s Island area. Extensive historic research was carried out about buildings which had little know about them previously. You may not want to set fire to your historic buildings to generate interest public in the historic environment but you might want to know what to do when fires like this happen and how best to handle it. The IHBC Annual School in Nottingham from 4th to 6th July will cover all manner of possible risk to heritage including fire and look at how risk can be managed and resilience developed.